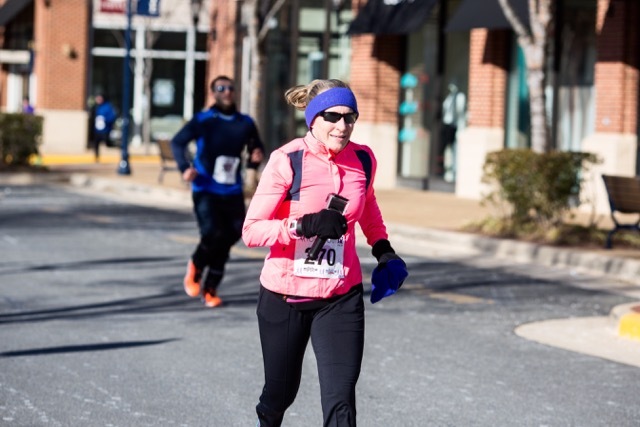 I hadn’t planned on running a winter race this year until I won an entry into the Run Your Heart Out 5K back in January when I posted a picture of me running in the snow to Instagram and tagged @PotomacRiverRunning. 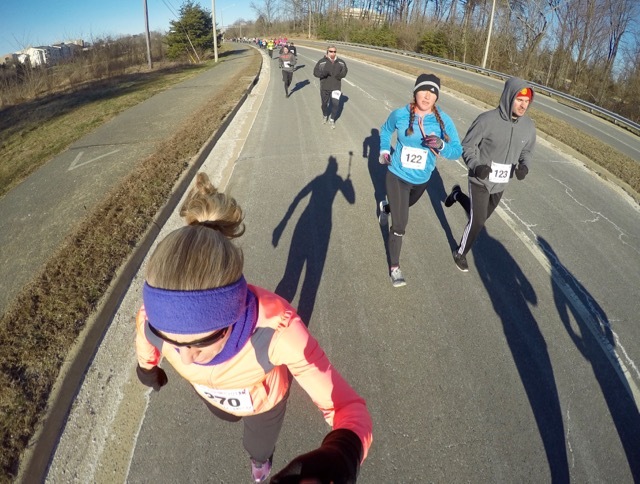 My picture won, and on Sunday I found myself toeing the starting line with the air temperature at a balmy 15° F compared to the 3° wind chill. It had been two years since I ran the Run Your Heart Out 5K. 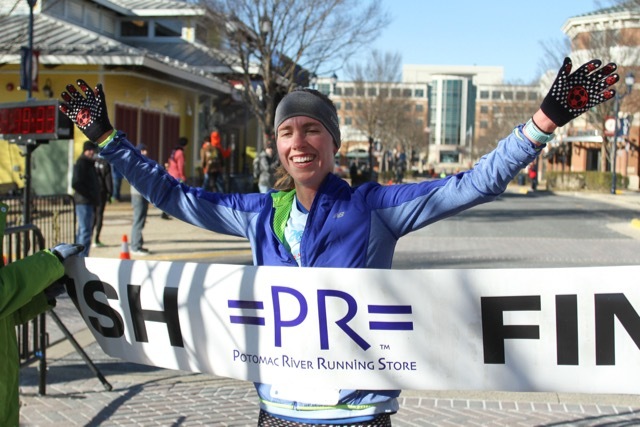 At that time, it was run along the wooded trails in Reston, starting and finishing at South Lakes High School. That year I ran with Bill and my good friend Beth. 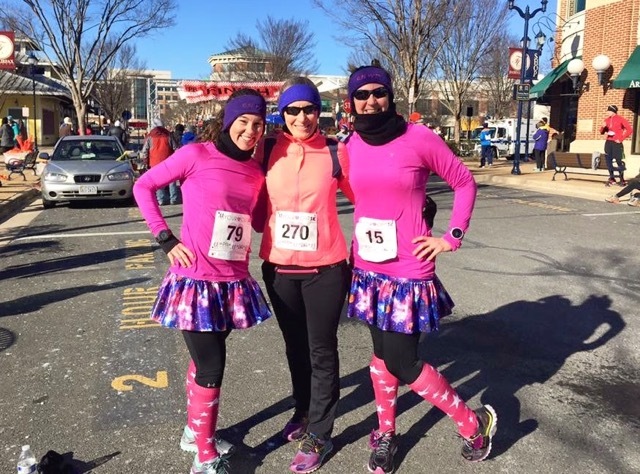 This year I would be running the race in Fairfax, a new-to-me course, with birthday girls Erin and Melissa, two friends who I hadn’t even met yet in February 2014. 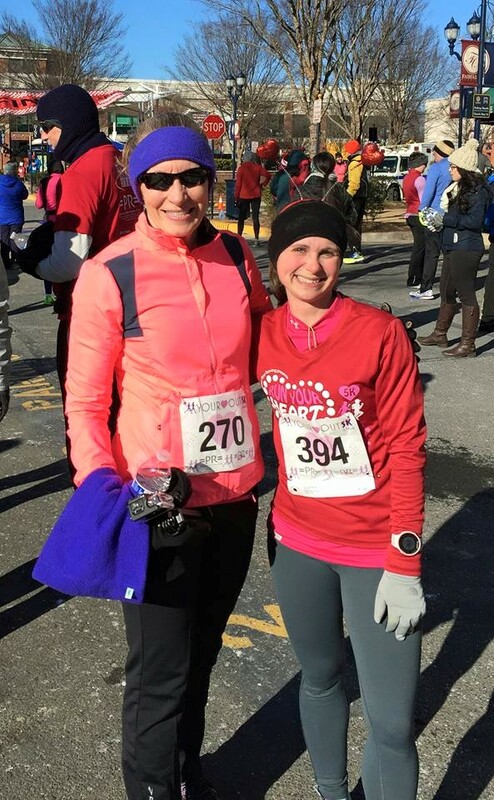 Erin had celebrated her birthday the day before the race, and Melissa was celebrating her birthday that very day, Valentine’s Day! 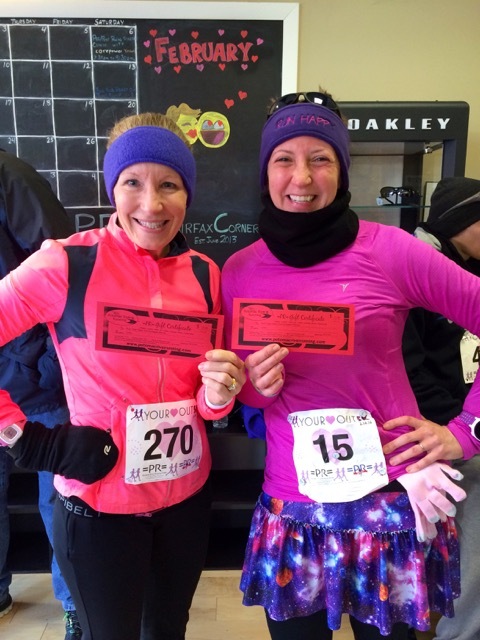 Our timing couldn’t have been better, and we arrived at the race with about 15 minutes to spare – just enough time for me to run to the porta potties and then meet the girls at the starting line. Running back from the porta potties to find my friends at the starting line, I ran past one of the photographers taking a picture of =PR=’s fancy van. The second I realized that he was taking a picture, I made a quick turn to the right to get out of the way. Guess I didn’t quite move quickly enough! Despite the unbearable sounding temperature, it didn’t seem that bad. In a panic the night before, I dug through my ski bags and found a neck gaiter and thermal top. Both items felt great while waiting the few minutes for the race to start, but once I started running, wearing them was a big mistake! As we lined up for the race, we saw Angela and Tina and decided to get a quick picture. I first met Angela at the 2013 Firecracker 5K when I asked for a picture of her for my blog, and we’ve since followed each other on Instagram. 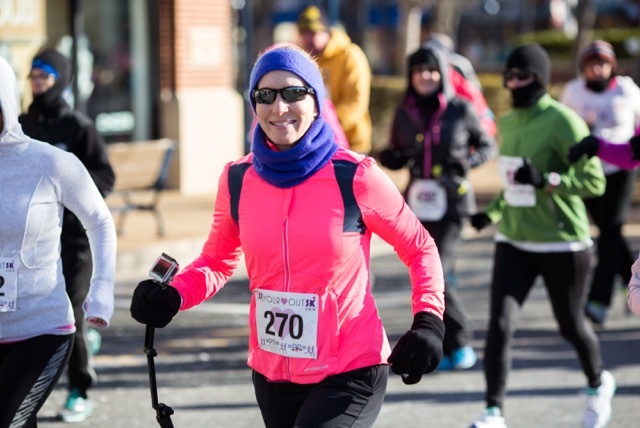 Shortly after we started the race, one of the race photographers captured this picture of me smiling, because, well, it was the start of the race and not the end. 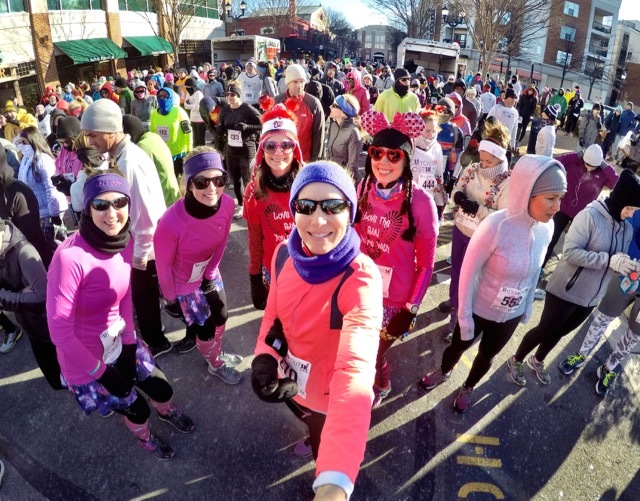 Right after we cleared the starting line, I pulled ahead and snapped this fun picture of the birthday girls in their twinsies outfits with my GoPro (affiliate link). Notice that they’re even running in stride. With only about 360 runners, the crowd thinned out quickly, and oddly for a 5K, I often found myself running alone. Before we even got to the half-mile mark, I started overheating and took off my neck gaiter. I tried unzipping my jacket, but got too cold so I zipped it back up. Usually when I wear this particular thin Brooks jacket (affiliate link), I can only wear a short sleeved top under it or I get too hot. Even with the extreme cold, had I chosen a long sleeved race shirt instead of the thermal top, I would have been fine; but no, I panicked when I saw the weather forecast and overdressed. At around the two-mile mark (I think), I caught up with Andrea. I know her from Instagram and often notice that we’ve run in the same race. I knew that she planned to be there, so I’d been watching out for her. We ran alongside each other for a while until I dropped my neck gaiter and had to turn to pick it up. Struggling slightly on the hill, it was too much for me to catch her and she pulled ahead running strong. 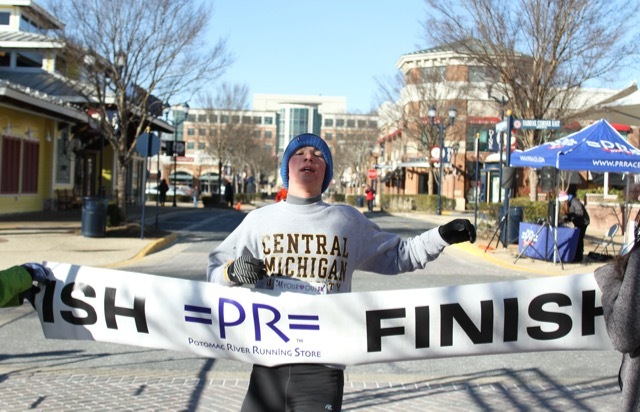 Meanwhile, back at the finish line, 17-year old Jake Kloman won the race with a time of 17:32 (5:39 pace). Congrats, Jake! And exactly two minutes later, the first female to cross the finish line was Hannah Pearson who finished in 19:32 (6:18 pace). Congrats, Hannah! Determined not to get yet another picture of me grimacing as I pushed toward the finish line, I attempted to smile. I finished in 27:16 (8:47 pace) which was good enough to get me a second place finish out of 13 women in my age group; yet over two minutes slower than my recent 5K times. 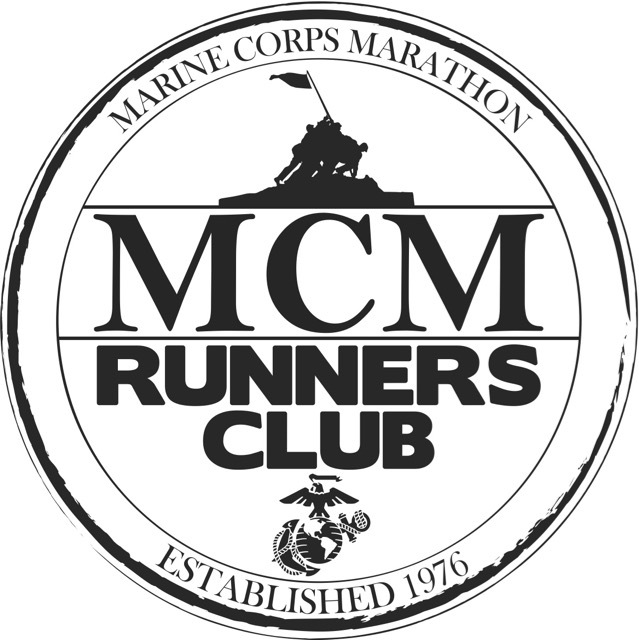 I attribute my slower time to poor and inconsistent training this winter, and the lack of a real warm-up run prior to the race (running to and from the porta potties doesn’t count). Surprisingly, the extreme cold temperature didn’t seem to bother my cold-induced asthma, and I didn’t cough or wheeze at all. After I crossed the finish line I quickly found Erin and Melissa who were cheering me in. We got someone to take a picture of us – Deb between the sparkly birthday girls. Throughout the race I chased my friend Cindy who I only get to see at races. As hard as I tried, I just couldn’t catch up to her. She didn’t realize I was behind her, yet she was the carrot dragging me along! I was happy to find her once I finished, and get to catch up with her and her husband Dustin. After chatting with Cindy and Dustin, I found Andrea mingling around the finish line. We chatted for a few minutes and had someone take a picture of us before heading our separate ways. Hopefully, I’ll see her at another race again soon! Since it was Valentine’s Day, the ever-creative Tina and Angela made a heart with their arms just as I happened to walk by; and they held the pose for me to capture a picture. 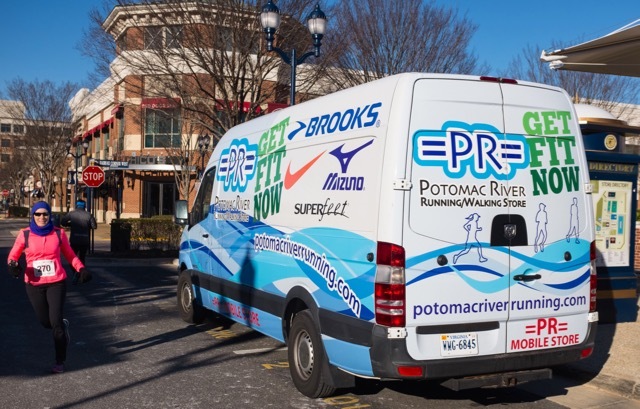 We heard an announcement that the awards ceremony was cancelled due to the extreme cold, but that we could stop by the Potomac River Running Store less than a block away to pick up our awards. Having turned a year older just the day before and having moved into a new age group, Erin was thrilled to learn that she’d placed second in her age group. 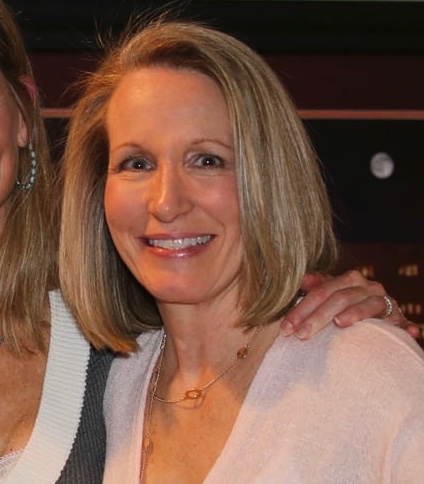 Remember my friend Cindy? Cindy beat Erin by just one second to win their age group! Just one second! Had both ladies realized that as they turned the corner to finish the race, it would have been fun to watch them sprint it out to the finish line! As we headed back to the car after all of the festivities were over, Erin and Melissa had to keep stopping and waiting for me as I stopped to chat with various people I knew. 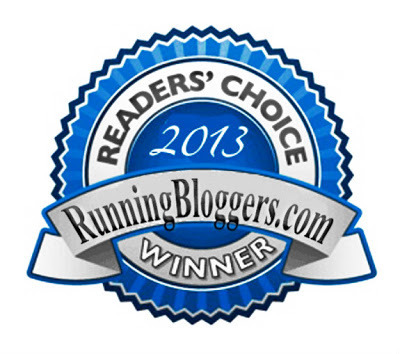 They created a new word, saying that I was “mayoring.” As the unofficial mayor of Runnersville, I feel that it’s my duty and an honor to chat with my peeps. 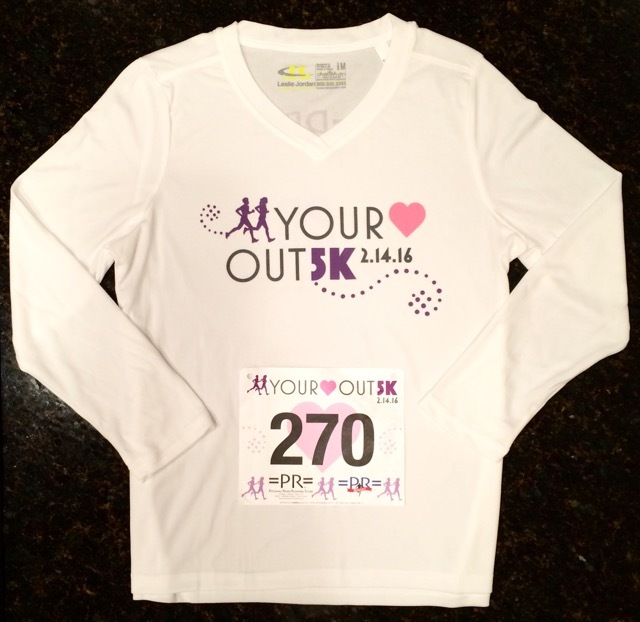 The race shirt is a long sleeved white shirt with a pale pink and purple design. I love the women’s cut and since I didn’t already have a white long sleeved race shirt, I was thrilled! 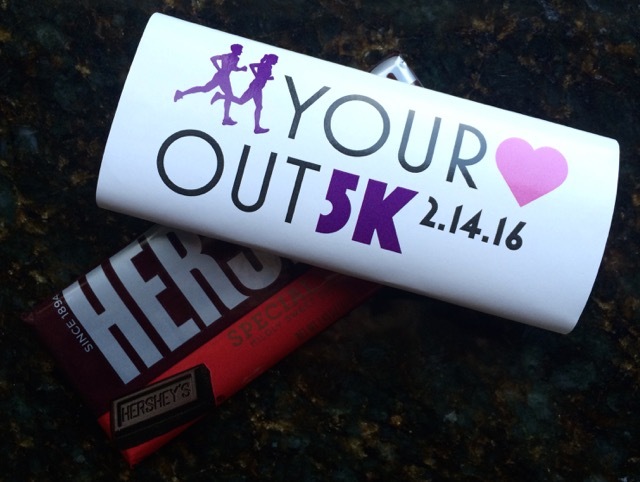 As an added bonus, our race packets included a little Valentine’s Day treat, our choice of either a dark or milk chocolate Hershey’s bar. 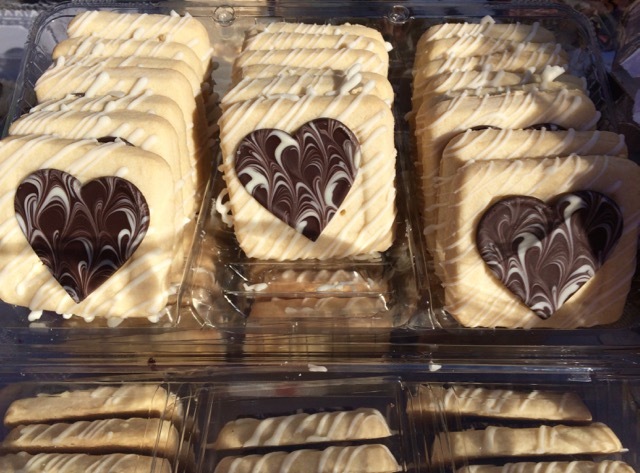 I discovered that Erin knows me well, because she knew at packet pickup to get the dark chocolate for me! And yes, you read that correctly, she picked up my packet on her birthday. What a great friend! 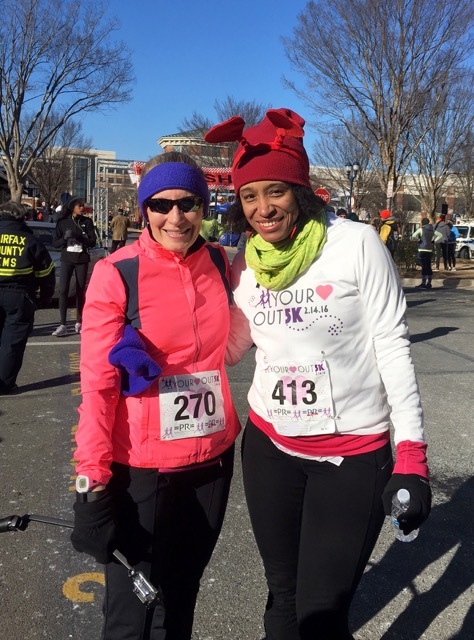 If you enjoy winter races, you don’t mind a deceptively slightly hilly course, and you love the festivities surrounding Valentine’s Day, you’ll love this race! Perhaps I’ll see you there next year! 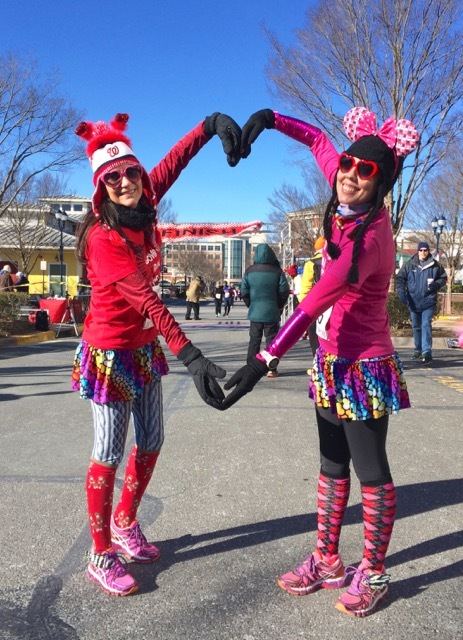 Have you run a Valentine’s themed race? What has been your favorite holiday themed race? Congrats to you on your age group win and to the birthday girls! Thank you,and thank goodness we were able to park very close to the start/finish line! Tough running, Deb. 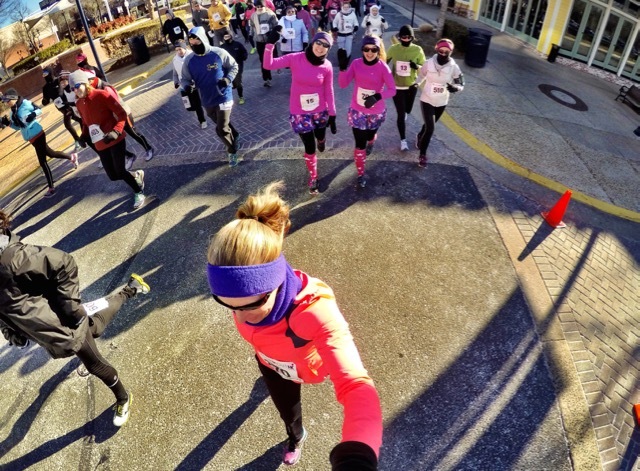 I love reading your stories of race day. 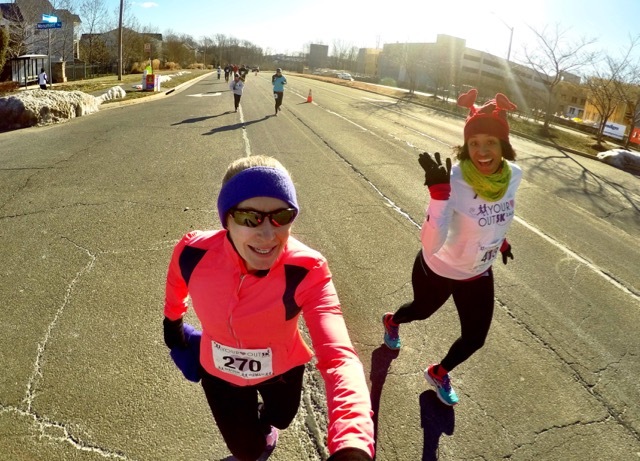 I’m gearing up for a 5K in March, so I actually have a running thing to write about in comments! Good for you, Eli! I hope your training and race both go well.